While the race to create a universal game pad controller for Android devices is in full swing, Apple has time and time again refused to give a controller solution the go ahead, until now. 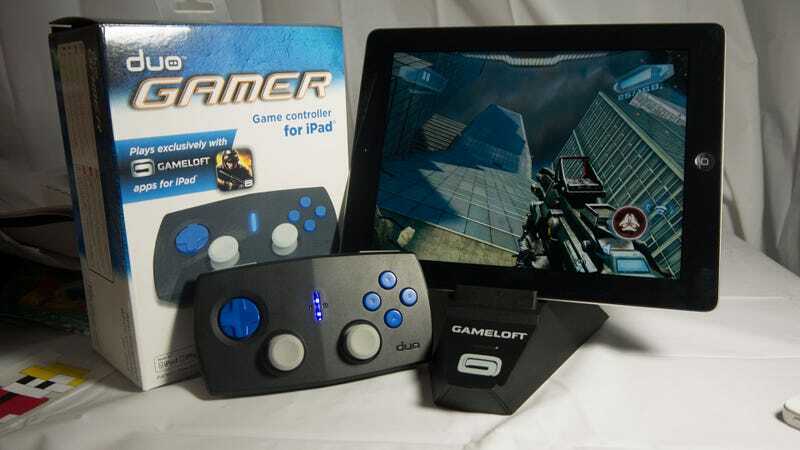 The Duo Gamer is the first officially-sanctioned game pad for the iPod, iPad and iPhone, but there's a catch — it works exclusively with Gameloft games. Discovery Bay Games, the company behind the Atari Arcade controller for the iPad, seems to have discovered the means to bypass Apple's anti-controller policy. The electronics giant doesn't seem to mind controllers dedicated to single game or publisher, so while a game pad that works with every iOS game won't fly, the Gameloft-exclusive Duo Gamer isn't a threat to anyone's touch-screen sensibilities. Thankfully Gameloft is responsible for some of the more console-quality, controller-friendly titles on the iOS platform. Titles like Asphalt 7: Heat, Order & Chaos Online and N.O.V.A. 3 – Near Orbit Vanguard Alliance all work with the Duo Gamer right out of the box. Connect the controller via Bluetooth, start the games and you're good to go. The game menus and hints reflex the pad's two analog sticks, d-pad, X, Y, A, B and shoulder buttons. It's that simple. The controller itself is pretty basic too. It's more or less a flat plastic brick with controls on it, tapering slightly at the sides for comfort with two ridges beneath it to serve as finger rests. The unit ships with a Gameloft-branded stand for supporting your choice of iDevice while in play. I've been toying around with the controller over the weekend, and so far it works as advertised. It only works with Gameloft titles of course, which never ceases to be incredibly frustrating. N.O.V.A. 3 plays wonderfully, and then I have to tuck away the controller and pick up my iPad to play Bastion with my fingers. For the $79.99 asking price I wouldn't mind a bit more freedom with the compatibility. Still, let's not discount the tiny triumphs! Apple has approved a Game Pad that works on the iPhone, iPad and iPod. Perhaps Gameloft and Discovery Bay have just taken the first step towards a future where we can play games on Apple devices any way we'd like. Or they could just make a different Duo Gamer for every iOS game publisher.